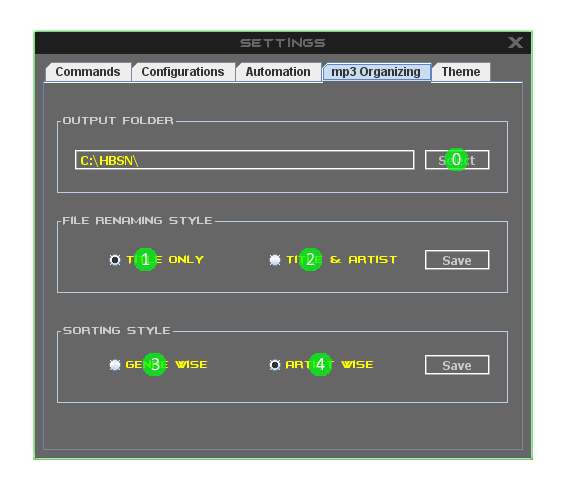 මෙතනින් කරන්නේ mp3 tag editor & organizer එකට අදාල වෙන settings හදන එක..
අපි බලමු මෙතන තියෙන settings මොනවද සහ ඒ වලින් කරන්නේ මොනවද කියල. 0.mp3 tag editor එකෙන් mp3 files වල tags edit කලාට පස්සේ අපිට ඒවා පිළිවෙලකට අපි දෙන ස්ථානයක අසුරන්න (copy) කරන්න පුළුවන් , එහෙම copy කරන්න ඕනේ තැන මේ select (0) කියන button එක click කරලා select කරලා දෙන්න ඕනේ. 1.එහෙම copy කරන සින්දුවේ file name එක title එක විදිහට rename කරනවා මේ option එක select කරලා save button එක click කරන්න. 2.copy කරන සින්දුවේ file name එක title එක සහ ගායකයාගේ නම සහිතව rename කරනවා මේ option එක select කරලා save button එක click කරන්න. 3.මේ option එක select කරලා save button එක click කරන්න , එතකොට mp3 files copy වෙද්දී ඒවා copy වෙන්නේ genre හැටියට වෙන් වෙන්ව copy කරනවා. 4.මේ option එක select කරලා save button එක click කරන්න , එතකොට mp3 files copy වෙද්දී ඒවා copy වෙන්නේ artist හැටියට වෙන් වෙන්ව copy කරනවා. මම ඊලග පොස්ට් එකෙන් පෙන්නන්නම් ඊලග tab එකවෙන themes වල settings හදන හැටි.